This article intends to provide detailed, step-by-step instructions that’ll help you set up Address Validation & Google Address Autocomplete Plugin for WooCommerce. Refer the product page to know more about other various features of the plugin. With this plugin, you can simplify customer checkout process by providing Google auto-complete feature for their addresses. The plugin also provides address validation feature, that will help you get rid of troubles of undelivered packages due to invalid addresses. Now, there is no need to call your customers for verifying their addresses. Use the Google autocomplete feature: By just providing Google API key, your customers will be able to get live address information, while they are entering their addresses. 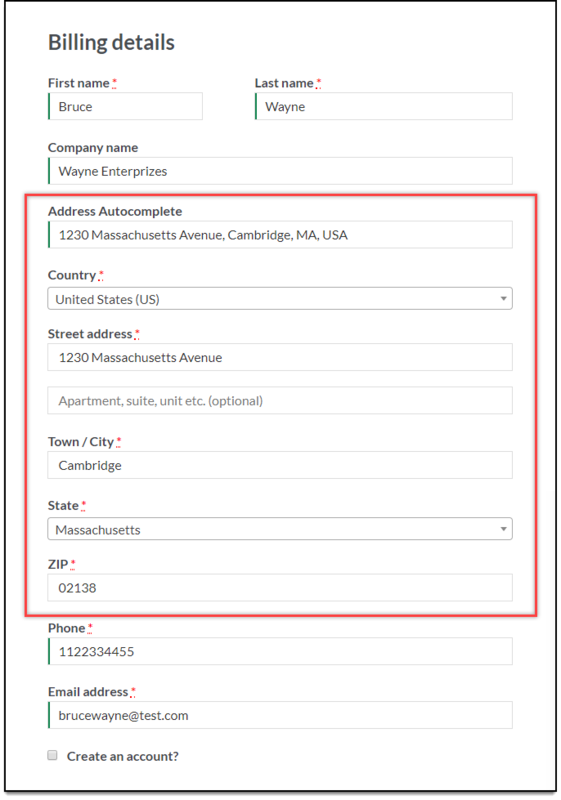 Edit autocompleted address fields: Some addresses might need editing, hence this feature will help your customers edit auto-completed address fields. Validate address using EasyPost, UPS or USPS: By providing respective credentials, you can validate address using EasyPost, UPS or USPS. Enforce address validation: This feature will not allow an order to be placed until a valid address is entered. Remember, this option will be ignored if EasyPost/UPS/USPS API server is down. Confirm validated address: Once customers’ address is validated, they will be provided with an option to choose from the originally entered address or the validated address. 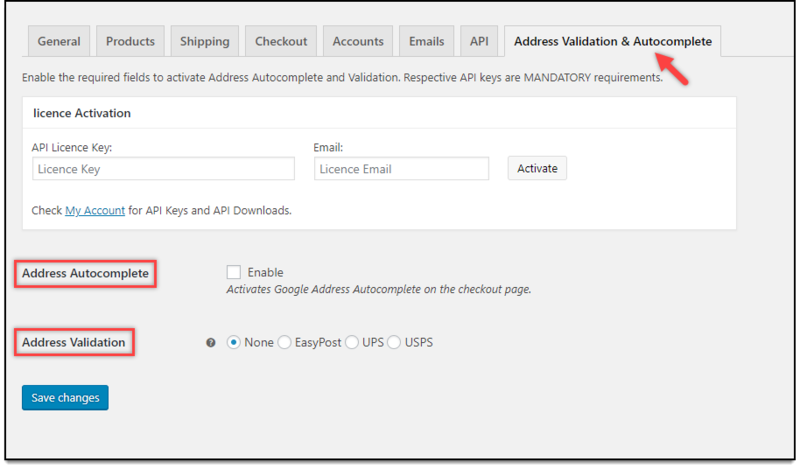 Dashboard > Plugins > Installed Plugins > ELEX Address Validation & Google Address Autocomplete Plugin for WooCommerce > Settings. The plugin settings are divided into two major sections – Address Autocomplete and Address Validation, as shown in the screenshot below. With these settings, you can achieve Google address autocomplete for WooCommerce stores. The settings are as shown below. Address Autocomplete: Tick this checkbox to enable the Google Address Autocomplete feature. Google API Key: Google API provides address autocomplete service which returns place predictions. The request specifies a textual search string and optional geographic bounds. The service can be used to provide autocomplete functionality for text-based geographic searches, by returning places such as businesses, addresses, and points of interest as the user types. Enter your Google API key in this field. Remember, by default, Google address autocomplete API usage is limited. Hence, to know how to increase the limit, read this article. Label Name: A custom label name for the address autocomplete text-field. 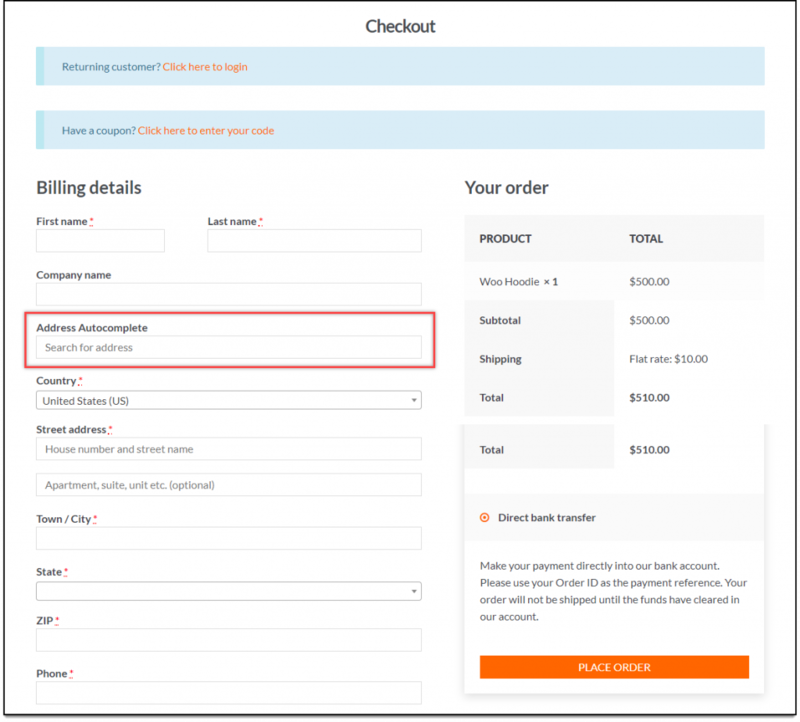 Editable Address Fields: By default, address fields on the checkout page are disabled unless an address is selected from Address Autocomplete option. Tick this checkbox to enable those address fields, even before selecting an address from autocomplete address option. 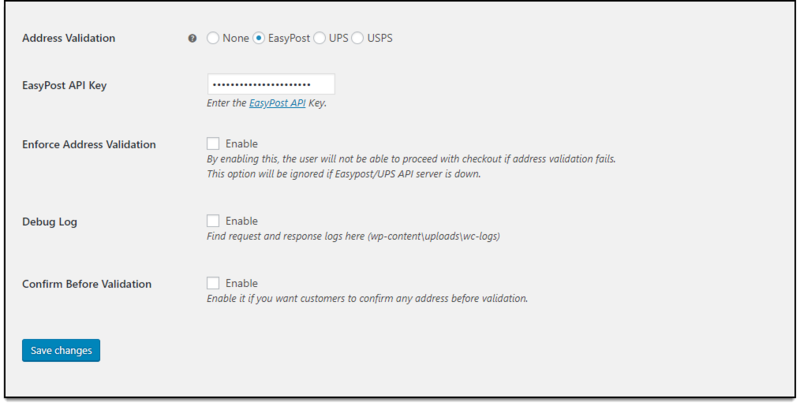 These settings help in validating your customers’ address using EasyPost, UPS, and USPS. The settings are as shown below. EasyPost Address Validation – Select the EasyPost option to enable EasyPost address validation, the further setting appears as shown in the screenshot below. EasyPost API Key – EasyPost API for address verification can improve an overall deliverability of your packages, acting as a safeguard against errors that send packages awry. With EasyPost, you can get instant access to domestic address verification and international address verification. Enter your EasyPost API key in this field. To get your API key, get started here. Or visit Address Verification API, to know more about EasyPost address validation. UPS Address Validation – Once you have selected UPS option for address validation, following settings appear as shown in the below screenshot. UPS Username, UPS Password & UPS License Key – Enter your UPS credentials in the respective fields. If you do not have these credentials, register with UPS. Once you have logged in to your UPS account with your credentials, request for an access/license key. USPS Address Validation – The address validation setting for USPS is as shown in the screenshot below. USPS User ID – For accessing USPS APIs, you need to register for a USPS account. After successful registration, you’ll receive User ID that you need to enter in this field. Tick this option to enforce address validation. The checkout will not be processed until a valid address is entered. This option will be ignored if EasyPost API server is down. Tick this checkbox to debug a problem. 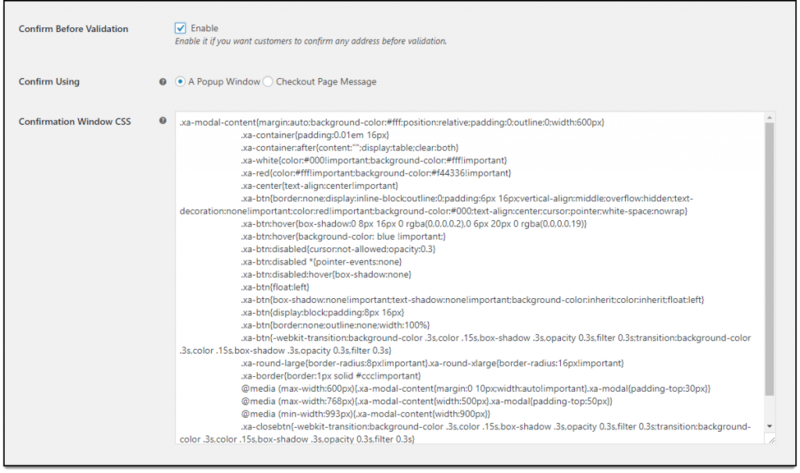 Find the request and response log at wp-content\uploads\wc-logs. Enable this setting to allow users to confirm the address before the validation process. If this setting is disabled, the users will not be shown the validated address returned from the selected shipping carrier, on the checkout page. Instead, the address returned is directly taken into account in the back-end, to proceed with the order. Confirm Using: For confirming address with your customers, you can either use a pop-up window or display address inline to the checkout page. The pop-up window option will open another option titled “Confirmation Window CSS“, that allows you to customize the pop-up window based on their website theme. Once all settings are configured, click Save changes. 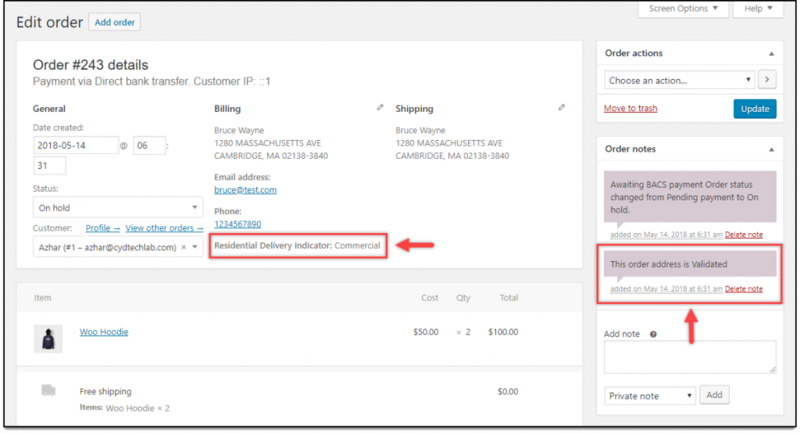 When a customer adds a product to the cart, and moves to the checkout, the address autocomplete option will be available as shown in the screenshot below. 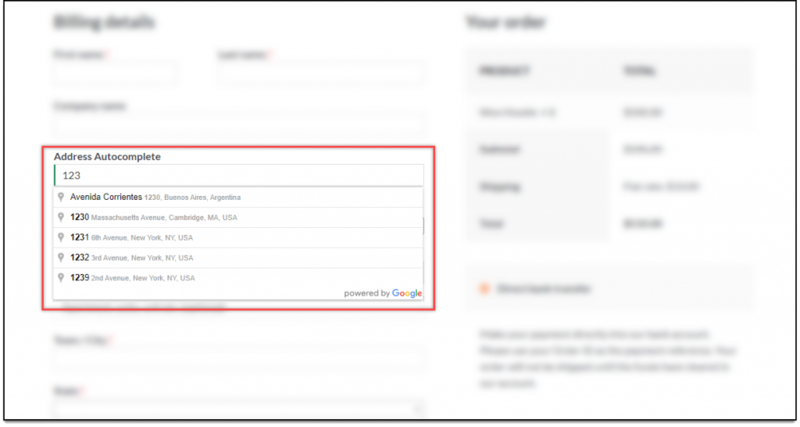 When the customer starts typing the address, the possible address is auto-suggested, as shown in the below screenshot. Next, when the correct address is selected, other address fields are filled automatically, as shown in the screenshot below. When the customer selects the desired payment method and clicks the Place Order button, the entered address is validated and address suggestion is displayed as a message on the Checkout page(default choice). For some addresses, in addition to the five-digit postal code, an additional four digits is added in the suggested address. This code is the area code used in some countries around the world. If you have entered the address manually or used the Google autocomplete address field, and the area code is missing, the plugin validates the address and displays the suggested address(es) with respective area code. If you choose the address confirmation to be displayed using the pop-up window, it will be displayed as shown in the screenshot below. Finally, when the customer selects the desired address, the order can be placed. In addition to this, you can see the type of address (Residential or Commercial) in the WooCommerce edit order page. You can also find the WooCommerce Order notes updated when the address is validated. This order note will be updated for validated addresses only. Following is a sample screenshot of a WooCommerce edit order page. Therefore, with these simple steps, you can incorporate WooCommerce address validation and Google address autocomplete feature on your WooCommerce store.